Here are a couple more photos of the now-famous "dinosaur dance floor" in northern Arizona. 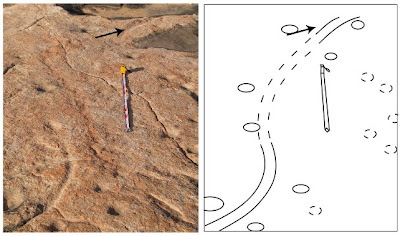 The top photo/drawing shows a rare imprint of a dinosaur tail dragged across the sand. The lower one shows the extent of the footprint site in the Navajo Sandstone near Coyote Buttes. Update 7pm: Popular Science posted a gallery of 10 photos of the track site and the local scenery, including an index map. Prayers for Arizona copper mining? Jack Caldwell writes one of the more provocative blogs about mining, "I Think Mining." 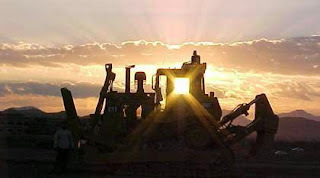 He has a new post today entitled "No prayers for Arizona copper mining" that was triggered by a blog on prayerbeacon, about things Christians should pray for regarding the upcoming election. Each day focuses on a different state and Arizona's turn is up, with a set of Prayer Points targeted to us. *Declare that mining is good for the economy of the state. *Declare that the leaders of Arizona develop the mining resources of the state wisely and responsibly. *Declare that less government, fewer Wal-Marts, and more mines and similar may help God help the economy of the state of Arizona. You should read all of Jack's column. It's probably not what you expect. Rumors out of India say that Sterlite Industries has reduced its offer to buy Tucson-based Asarco from $2.6 billion to $2.1 billion. Last week Sterlite parent corporation Vedanta Resources said the original bid was over-valued in today's market of falling commodity prices, particularly copper, which has dropped by more than half from its peak. 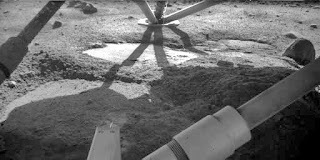 The UA's Phoenix Mars Lander went in to safe mode yesterday due to a low-power fault brought on by dropping temperatures (a high of -50F to a low of -141F) and a dust storm that reduced sunlight to the solar panels. Engineers got the system recharging one of the batteries later, but they shut down two heaters and turned off other power users to keep some of the craft's instruments and systems alive. News of a documentary tv series on Denver mayor and former geologist John Hickenlooper [right] got me thinking about other prominent politicians who are geologists or at least have degrees in geology. Hickenlooper got his degree from Weslayan University and worked as a geologist with Amoco in Denver before opening the wonderful Wynkoop Brewery in LoDo (a mandatory stop every time I'm in Denver) that was key to transforming that part of the city. He was elected mayor in 2003 in a nonpartisan race. 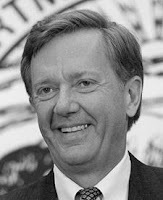 Former Arizona governor and Secretary of Interior under Bill Clinton, Bruce Babbitt [second from] graduated from the University of Notre Dame and attended Newcastle University in England on a Marshall Scholarship. 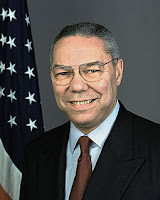 He ran unsuccessfully for the Democratic nomination for president in 1988. According to wikipedia, Chinese Premier Wen Jiabao [left] graduated from the specialty of geological structure of Beijing Institution of Geology. 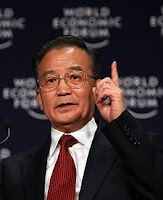 Having studied geomechanics in Beijing, he began his career in the Gansu geology bureau; from 1968-1978, he presided over the Geomechanics Survey Team under the Gansu Provincial Geological Bureau and head of its political section, rising as chief of the Gansu Provincial Geological Bureau and later as Vice-minister of Geology and Mineral Resources. Do you know of other geologists who are or were in prominent political positions? There is so much planetary geology being done from Arizona lately, I wonder if I should change the name of my blog. Now, besides Phoenix Mars Lander, Mars Reconnaissance Orbiter HiRISE camera, lunar rovers, ASU's meteorite collection, and Mercury MESSENGER, we can add the news that a traveling exhibit of 3-D images of Mars from the European Space Agency's Mars Express Spacecraft opened this past Saturday at the Lowell Observatory in Flagstaff. The Lowell Observatory blog says the exhibit themes include water, ice, tectonics, volcanoes, atmosphere and erosion. A New Perspective on Mars will be displayed at Lowell through December 3. Thanks to Coconino Chronicles blog for spotting this. 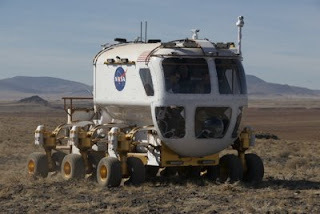 Last week's field test of the new lunar rover prototype around Black Point Lava Field in northern Arizona was the first public unveiling of the vehicle, so it's been attracting worldwide attention, including from a number of automotive web sites and blogs. So, for all you car buffs and technophiles, here is the NASA Fact Sheet. But, is the moon roof optional? Robinson said they aren't sure what the material is that fills some craters but it shows the planet is not as tectonically quiet as previously thought - there was active volcanism all over the planet. 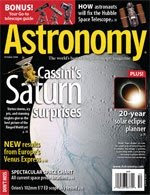 The Center for Meteorite Studies (CMS) in the School of Earth and Space Exploration at ASU was featured in a multi-page spread in the October issue of Astronomy magazine (but you need a subscription to view it). The article, Inside Arizona's meteorite treasure chest, describes "tens of thousands of space rocks" hidden away at ASU. CMS says it houses "around 10,000 specimens representing over 1,600 separate meteorite falls, making it not only the largest university-based collection but also placing it in the top ten in the world." CMS is justly proud of their impressive selection of Arizona meteorites, which are the focus of a new display at the Cave Creek Museum this month. 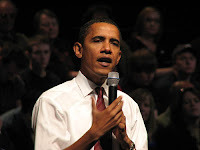 Both Senators Obama and McCain have responded to a list of questions sent by the Association for Women in Science and the Society of Women Engineers regarding the candidates' positions on issues and legislation that affect women in STEM. AAAS joined Scientists and Engineers for America and other science and engineering organizations to sponsor a debate on October 21 entitled "Presidential Perspectives on Energy and Innovation" with Kurt E. Yeager, Co-Chair of the McCain California Energy Security Coalition, and Daniel M. Kammen, Senior Adviser on Energy and Environmental Policy for Barack Obama. Also on October 21, advisors to Obama and McCain discussed the education policies of their respective campaigns in a moderated debate at Columbia University's Teachers College. The debate featured Lisa Graham Keenan, former Arizona Superintendent of Public Instruction and advisor to Senator McCain and Linda Darling-Hammond, the Charles E. Ducommun Professor of Education at Stanford University and advisor to Senator Obama. The October 24 issue of Science compares the candidates' stance on various policies related to science and examines other science policy issues that the next president will face. The AAAS Science and Technology in the 2008 Presidential Election website contains updates on these and other events and reports in its October newsletter. 5. Energy - What's missing from the current energy debate? 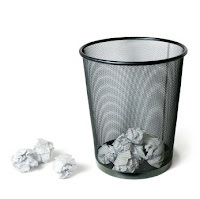 A look at sustainability issues. 7. Ira Flatow on science in America today - An outstanding discussion - coming soon! Four survival heaters will be shut down, one at a time, that keep the electronics within tested survivable limits. Certain instruments will stop operating as each heater is shut down. The remaining energy is intended to power the lander’s main camera and meteorological instruments until the very end of the mission. The first heater to be turned off today "warms Phoenix’s robotic arm, robotic-arm camera, and thermal and evolved-gas analyzer (TEGA), an instrument that bakes and sniffs Martian soil to assess volatile ingredients. 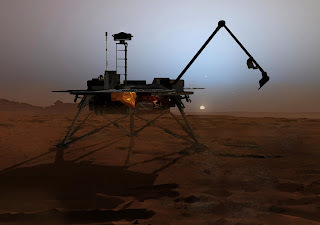 Shutting down this heater is expected to save 250 watt-hours of power per Martian day." A second heater powers a unit that hasn’t been used since landing, while "the third heater warms Phoenix’s main camera -- the Surface Stereo Imager –and the meteorological suite of instruments. Electronics that operate the meteorological instruments should generate enough heat on their own to keep most of those instruments and the camera functioning." Once they turn off the fourth heater -- one of two survival heaters that warm the spacecraft and its batteries -- the last remaining survival heater will run out on its own. Mineweb reports that the top 20 mining stocks in the world have lost an average of 74% of the value from their peaks, equal to $1.1 trillion. The world's top 20 oil and gas companies are down only 60% from their highs, with a loss of $2.2 trillion. But if you think your stocks are trash, consider major Russian oil companies which have lost 76-81% of their values. Blasting officials as bureaucrats who just want to stop everyone from having fun and finding fabulous treasures in abandoned mines, an article in the Nov. 10 issue of Forbes magazine, extols the recreational benefits from exploring abandoned mine shafts. After all, they argue, the number of deaths and injuries in abandoned mines is small compared to those from all-terrain vehicles. Net profits fell from $627.8 million a year ago to $417.8 due to higher costs, and declining copper prices as demand falls with weakening global economies. The company said it is going ahead with plans to develop and expand copper projects in Peru. 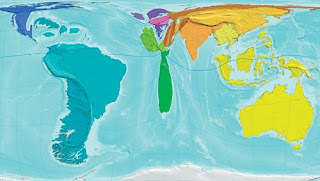 The new "Atlas of the Real World" uses computer manipulation of maps to represent data in visually arresting displays. The map at right represents territory sizes as an indication of the annual "mineral depletion" in each. They define mineral depletion as "the loss of potential future income, at current prices, due to the quantities of minerals currently being extracted." Small areas on this map may lack minerals or mined out the ones of value. 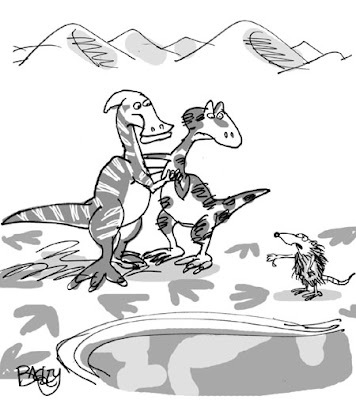 Pat Bagley, editorial cartoonist for the Salt Lake Tribune is holding a contest for the best caption for a cartoon about the newly interpreted 'dino dance floor' footprint site in northern Arizona. Submit your entry to caption@sltrib.com by midnight Tuesday, Oct 28. I was uploading photos onto the pc and found this one from the GSA meeting in Houston earlier this month. Recognize UA geologist and Dean of Science Joaquin Ruiz in the poster on the left? The pictures were part of a series around the hall showcasing the membership of the society. "Piled Higher and Deeper" (PhD) Comics is one of the best online comic strips and a favorite of mine. This one from a couple days ago was picked up by the New York Times economy blogger and is stirring up wider responses than the comic normally gets. Given the budget turmoil at UA and elsewhere, it hits home. "One configuration leaves the crew members free to get on and off the rover whenever they like, but they must wear spacesuits at all times to protect them from the lunar environment. 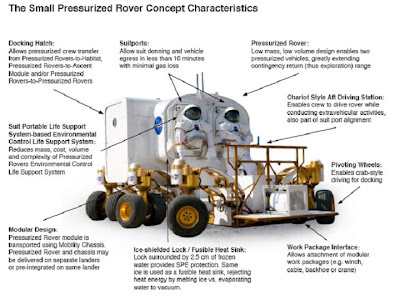 The second configuration — called the Small Pressurized Rover, or SPR — adds a module on top of the rover’s chassis that the crew can sit inside as they drive the vehicle, donning spacesuits whenever they want to get out. 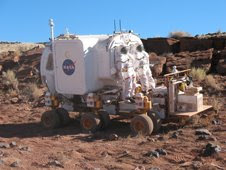 "For the first week of tests, the rover has been driven on day-long trips to determine how each configuration performed. These have been some of the longest drives the prototype has ever made, but next week the group will step it up another notch or two, by going on a three-day drive through the desert in the SPR to determine how it performs and whether it’s comfortable enough for long-duration trips." You know, I think I saw the SPR on I-10 doing about 10 mph. I figured it was just a couple of snowbirds heading to the RV campground. 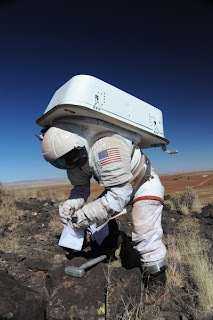 Update (18:42 10-25): Today's Flagstaff Daily Sun newspaper ran a feature story on the rover test. 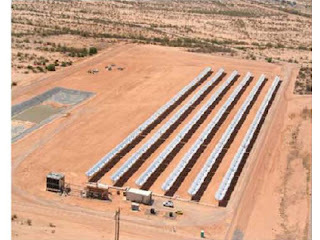 The tests are taking place at Black Point, about 60 miles north of Flagstaff. The paper has many more photos of the rovers and spacesuits. Fred Spilhaus announced his plans to step down as Executive Director of the American Geophysical Union in June 2009. Fred's been with AGU since 1967 and director since 1970. I bumped into Fred at the GSA meeting in Houston earlier this month and with his usual smile he sounded bemused that the coming fall meeting of AGU would have 13,000 abstracts and 16,000 attendees. Fred beamed when he told me membership was at 55,000 [right, from EOS Oct 28 issue]. There's a fascinating mini-history of AGU in the new issue of EOS. 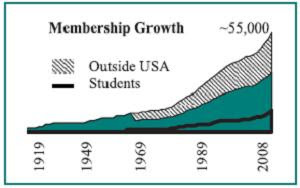 The first Fall meeting was held in San Francisco in 1968, the same year that dues increased from $16 to $20. They are still $20 today. Bob Linsell [right], Resource Manager for Granite Construction, took us into their sand and aggregate quarry at their Swan Road facility near the Tucson Airport, to talk about the geology of the materials they mine. The top 5-6 feet of the Quaternary sediments are caliche-rich which requires that it be bulldozed off. The caliche breaks into blocks that act like cobbles in the aggregate mix but are too weak for the asphalt. Even the crushed caliche is a problem because it absorbs too much moisture. The underlying sand and gravel layers are the main resource although Bob says they could use more rocks compared to the sand volumes. The rocks are crushed to create rough surfaces for improved adhesion in the asphalt. In the picture at right, Bob is standing at the top of a clay layer that is as much as 17 feet thick in places. The company quarries the sand and rock down to the clay layer but is planning on eventually cutting down through the clay to an underlying set of sand and gravel layers that extend down 65 feet. There is significant lateral heterogeneity of the deposits, which appear to include a variety of river, fan, flood, and valley deposits. Most of the clasts are sourced from the Santa Rita mountains to the south. We stopped by Granite Construction's open house at their Swan Road aggregate and hot asphalt plant just east of the Tucson airport. Granite quarries sand and aggregate on the 800 acre site that is crushed, heated, dried, and mixed with a small amount of oil to create asphalt for roads. They also recycle old asphalt and mix up to 15% of it with new asphalt. A million tires are ground up each year to be added to asphalt mixtures to make softer surfaces for playgrounds, jogging paths, etc. In the picture on the right, crushed rock goes up the conveyor into the cylindrical chamber in upper center, where it is heated to 380 degrees before being mixed with oil and cooled slightly before being loaded into trucks. The asphalt contains about 95% rock and only 5% oil. The aggregate is heated by burning used oil - you know, the oil drained from your car engine at Jiffy Lube. Gigapixel panoramas of the Grand Canyon [right top] and other spectacular geology sites, are posted at the GigaPan website. AGI sent out an email today, describing some of the highlights from Earth Science Week 2008. The GigaPan website launched a series of collections of GigaPan images of landforms and geologic processes. Each day, a new collection of geoscience-themed GigaPans was featured. You can zoom into selected areas on the panoramas for tremendous detail [right, bottom]. The site allows you to set up a free account where you can log in, take “snapshots” within GigaPans, and annotate them to share your discoveries with other users. Augusta Resources announced increased resource estimates for their Rosemont copper mine in the Santa Rita mountains south of Tucson based on new drill holes and further analysis of older core. Augusta described a "total (oxide, mixed, sulfide) measured and indicated mineral resource increase of 386 million pounds of copper equivalent, which represents a 5 percent increase over the previous resource calculation. The associated inferred resource has increased by 14 percent on the basis of an additional 268 million pounds of copper equivalent." 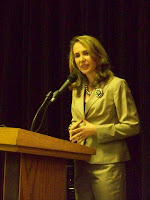 Decision on Rosemont in July 2010. My contacts say Augusta has been cutting back on other projects in order to focus on the Rosemont mine development. 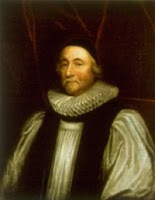 The universe, and the Earth along with it, turned 6,011 today, according to the calculations of James Ussher, Archbishop of Armagh and Primate of All Ireland. Ussher's most famous work was a chronicle published in 1650, drawn from religious and historical references, leading him to conclude that creation occurred at nightfall preceding October 23, 4004 BC. Some references mistakenly report that the time and date were 9 am or pm on October 23. Such calculations were a not uncommon approach by scholars of that period, but Ussher's scholarship and detailed knowledge of history gave great credence to his interpretations. So, while some groups have adopted the 6,000 year age of the Earth as a article of faith, one could argue that it is, in fact, one of the first scientific attempts to determine the Earth's age. Ussher carefully researched his study, using the best references available to him. He described his assumptions, made interpretations of contradictory data on a rational basis and documented his procedures and conclusions. That sounds like the scientific method. Since then, we have new data and new tools that show how old the universe and the Earth truly are, but Bishop Ussher gets an "A" for effort. In 1997, we celebrated the 6,000 anniversary which coincided with the annual GSA meeting in Salt Lake City. The award was presented at the 20th annual von Braun Memorial Celebration held last night at NASA's Marshall Space Flight Center's Davidson Center for Space Exploration in Huntsville, Ala. The event honors the memory of von Braun, one of the most important rocket developers and champions of space exploration from the 1930s to the 1970s. 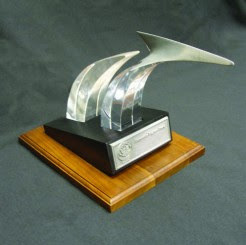 The Huntsville chapter of the National Space Club, which sponsors the ceremony, gives the Astronautics Engineer Award, established in 1991, to scientists and engineers who have made outstanding contributions to United States leadership in the field of rocketry and astronautics. Will Asarco reconsider Grupo Mexico offer? Asarco drew on the $50 million line of credit deposited by Sterlite Industries, in what analysts describe as the 'last nail in the coffin' on the proposed buyout by the India-based company. Speculation is mounting that Asarco will rethink the rejected offer by Grupo Mexico. The recent drop of 30% in Freeport McMoRan's 3rd quarter earnings has become the poster child for declining copper prices. Copper hit its lowest level in about the last 3 years today. October futures fell to just a fraction over $2 per pound on Tuesday, in large part to reports that China is experiencing less than expected growth. The Havasupai Tribe announced a $1 million donation that will allow them to build an early warning system for floods and repair damage from the August flood that devastated their Grand Canyon home. The donation is from the San Manuel Band of Serrano Mission Indians which is based in San Bernardino County, California. The Tucson Weekly describes the education debate between Congresswoman Gabrielle Giffords and challenger, State Senator Tim Bee for the 8th District seat. Giffords says creationism doesn't belong in science classrooms, although it would be fine to teach it in religion classes, Sunday school, churches and at home. "Science needs to be taught in science classrooms." Bee says the federal government shouldn't decide what should be taught in local classrooms, but adds that "there are competing opinions out there and children can make their own decision about what they believe about the world and how it came to be and that information is good to provide and let people think." He says it's important to teach critical thinking skills. Giffords response is consistent with the position of the scientific community. Bee's position parallels that of the Discovery Institute, the chief proponent of Intelligent Design. Debris flows have left a 20,000 year history in the canyon mouths of the Santa Catalina foothills in Tucson and will occur again. 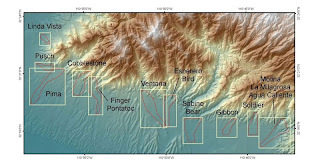 A new report by AZGS geologist Ann Youberg is being released in the morning with maps of debris flow deposits in 15 canyons along the mountain front. The report includes 11 digial 1:6,000 scale maps on CD. 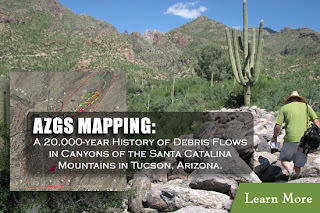 The work was done in cooperation with the U.S. Geological Survey for the Pima County Regional Flood Control District to assess the potential for more debris flows following the spectacular events in Sabino Canyon and other areas in July-August, 2006. In recent years, the foothills have seen a boom in new housing in and around canyon mouths. Many, it appears, are built on or adjacent to prehistoric debris flows. Ann and her colleagues concluded that the 2006 events are rare occurrences in individual canyons – on average they probably occur once in a thousand years or longer. However, invasive plant species are making the foothills more susceptible to wildfire and increased runoff on steep slopes. That could lead to larger and more frequent debris flows. Reference: "Geologic mapping of the debris flow deposits in the Santa Catalina Mountains, Pima County, Arizona," 2008, A. Youberg, M.L. Cline, J.P. Cook, P.A. Pearthree, and R.H Webb, AZGS Open File Report-08-06. The dancing dinosaurs of Arizona have struck a chord with the news media not only in Arizona, but also nationally and internationally. There's a web site for science journalists that analyzes selected science stories of the day as a peer review service - Knight Science Journalism Tracker. They review the press release and subsequent press coverage for the dino story and offer links to a number of sources that handled the story in different ways. It ranges from humorous to scholarly to skeptical. Mono Lake in Arizona, NOT! Note to National Geographic: you can't see the Sierra Nevadas from Arizona. National Geographic posted a new gallery of exquisite photos in their online science gallery, this time showcasing examples of weathering and erosion, with two photos identified as from Arizona. One is by Larry Fellows, former State Geologist of Arizona, so it got my attention. The caption says, "With the snow-draped Sierra Nevada as a backdrop, unique erosion formations called sand tufa stand like giant cauliflower stalks in a dry Arizona lake bed." Now, to my knowledge, there is no place in Arizona where you can see the Sierra Nevadas, especially as close and clear as they are in this photo. 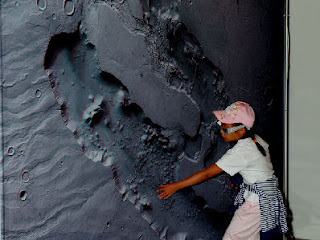 So, I emailed Larry who replied that he didn't know that NG was using the photo but they probably got it from the AGI Earth Science World Image Bank. He also said it definitely was not a picture taken in Arizona, but rather shot south of Mono Lake. Oops. Profits for Freeport McMoRan Copper and Gold Inc. dropped by 33% for the third quarter due to falling metals prices, and the company said it will shelve plans for expansion of the Sierrita and Bagdad copper mines. 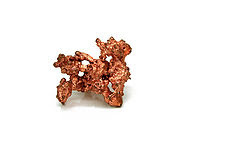 In addition the restart of the Miami copper mine [right, credit Freeport McMoRan] will be put on hold due to slowing global economic conditions and demand for copper. Freeport had planned on investing $370 million on these three projects. 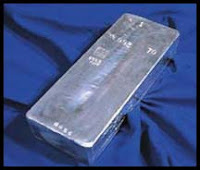 They expected production of 180 million pounds of copper and 6 million pounds of molybdenum annually starting in 2010. The US Dept. of Energy awarded $4.35 million to Arizona Public Service and Tucson-based US Solar to develop thermal storage systems for solar energy. One of the test sites, the Saguaro Solar Power Plant [right, credit APS], near Red Rock, north of Tucson, will store the energy in oil in a tank filled with rock. The other site is in Georgia and will use sand to absorb the heat for use later. The Skunk Creek Landfill [right, credit Phoenix.gov] in Phoenix will supply enough methane gas produced from decaying garbage to generate 30,000 megawatt-hours of power. The power will go to Pasadena, California under a 20-year contract and is about enough to supply about 5,000 homes according to local officials. The cost of the methane power will be about $550,000 more than non-renewable energy but is part of that city's green goals. 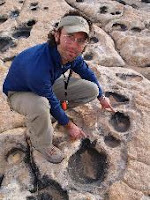 Two UofU geologists identified an amazing concentration of dinosaur footprints that they call "a dinosaur dance floor," located in a wilderness in the Coyotes Buttes area of Arizona near the Utah border where there was a sandy desert oasis 190 million years ago. 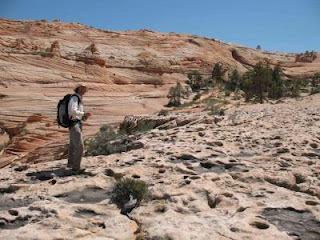 The site - a 6-mile roundtrip hike from the nearest road - is in Arizona in the Coyote Buttes North area of the Paria Canyon-Vermilion Cliffs Wilderness, which is part of the U.S. Bureau of Land Management's (BLM) Vermilion Cliffs National Monument. The track site - about halfway between Kanab, Utah, and Page, Ariz. - is near a popular wind-sculpted sandstone attraction known as the Wave. 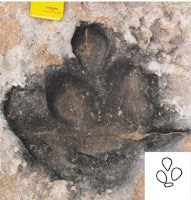 The 2.4-inch-wide tail-drag marks - which are up to 24 feet long - are a special discovery because there are fewer than a dozen dinosaur tail-drag sites worldwide, Seiler says. The New York Times, added another chapter on Friday to its series "If Elected..." by covering the positions of senators McCain and Obama on science, technology, and innovation. The Times followed up today with a column summarizing each candidates stance on high profile S&T issues. The Times also totaled up the federal budget costs for each candidates technology and innovation proposals. 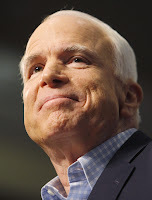 Obama's come to $85.631 billion, while McCain's total $78.825 billion. Even though the numbers are closer than I expected, a large part of the McCain plan ($57 billion) is the tax cost of expensing equipment and technology costs by business, where a big part of the Obama plan ($28 billion) is for doubling the federal investment in basic research. Hey, it's Earth Science Week! New geothermal assessment of U.S.